LIMA, Peru, June 7, 2018 — The U.S. Army South (ARSOUTH) and a member of the West Virginia National Guard’s (WVNG) State Partnership Program (SPP) conducted a combined workshop in Lima, Peru from May 28 through June 1, 2018, with Peruvian Army (PERAR) officers and NCOs in order to provide a foundation for institutional change to education and leader development within the PERAR NCO corps. Sgt. 1st Class Héctor Guillén, WVNG SPP coordinator and Peru native, taught classes in his native language of Spanish on various topics including leadership, mentoring, assessment and counseling, training education and promotions, and the duties and responsibilities of the NCO corps. These courses were presented to the three tiers of enlisted Soldiers during the three-day conference. Guillén grew up in a military family of officers in Peru, but has found pride serving as an enlisted Soldier, he said, and is happy to share his pride of service, knowing how well the United States enlisted are treated and well educated. While the Peruvian military has a large NCO corps, it does not traditionally hold the leadership responsibilities and standards of training and education associated with NCOs in the United States military. A 2016 Memorandum of Understanding between the PERAR and ARSOUTH outlined the foundation for institutional change to education and leader development of enlisted troops in order to form a more cohesive and capable armed forces. This event was the first NCO Professional Development held since the MOU signing and created a baseline foundation of understanding between the two militaries. The event was structured as open forum discussions about the roles and responsibilities that NCO’s hold in the U.S. Army. The team presented the historical background on how the system was developed and improved upon over the years as well as the development and implementation of NCO academy training curricula, standards and procedures. More than 750 NCOs and officers attended the Officer and NCO Professional and Development Subject Matter Expert Exchange, fostering discussion on the roles, responsibilities, talent management and professionalism of the PERAR NCOs. Future engagements will incorporate more mid-career NCO’s into the discussion which will ensure continuity of present to future efforts to build on Officer-NCO relationships and trust while creating a more professional and interoperable force. The WVNG and Peruvian military leadership also discussed working with all Peruvian Armed Forces in a recent SPP exchange to develop and implement NCO training and professional development into future engagements between the two militaries. 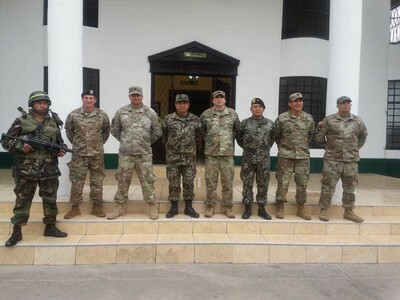 The WVNG and Peruvian Armed Forces have been linked together through the National Guard Bureau’s State Partnership Program since 1996 and have held more than 120 exchanges with one another since the establishment of the partnership.